The kindest thing I can say about Ishqedarriyaan is that it is yawn worthy, says Paloma Sharma. IshqedarriyIaan, V K Prakash's next Hindi venture after the 2009 Mithun-Dimple Kapadia starrer Phir Kabhi, is a love triangle so cheesy that you should order a plate of nachos with it. The film, strangely Sparksian in its approach to love and sacrifice, is bound to appeal to a demographic that is more emotional than rational. A simple tale of boy meets girl, girl meets another boy, boy falls in love with girl, girl falls in love with another boy and boy tries to make another boy fall in love with girl. Don't be. You'll be too bored by Mahaakshay Chakraborty aka Jimmy's dazed, doped expression and Evelyn Sharma aka Lara Aunty's deep sighs to bother with the story. A sort of a re-launch for our Jimmy boy, Ishqedarriyaan is quick to establish who the leading man of the film is. Agam Diwan (Jimmy) - heir and billionaire - saunters onto the screen, shows some desi business swag and proves to you what a bro he is by supporting the underdog. Meanwhile, Kaya, an American reporter of desi origin, is desperate to meet Agam in order to write a feature story on him. That's when we find out that Agam Diwan is so rich that no one's allowed to publish his pictures in the media or he'll sue them. Also, Agam Diwan doesn't believe in charity because if you teach a man to fish and all that jazz. When he refuses to give her a proper interview, Kaya digs up dirt on him and threatens to publish it. As it turns out, Diwan Senior's empire was founded on the basis of money that was obtained through fraud. Agam makes Himes Bhai level sad eyes. He decides to investigate his father's supposed misdeeds and to compensate the family that was defrauded. Film shifts to Himachal, because where else would you find a proper setting? Here, Luvleen (Evelyn Sharma/ *cue music* Lara Aunty), daughter of said victim of fraud, runs a school for underprivileged children, the female half of whom run around in Zara or Forever 21 black pencil skirts, thin white shirts and lipstick. In order to keep her school running, Luvleen is continually wandering from mansion gate to mansion gate to collect donations. It is in this process that she bumps into Arjun (Mohit Dutta) who mistakes her for the girl he's supposed to be meeting, for the purpose of entering into an arranged marriage with her, and falls for her. Luvleen falls for him right back. However, when Agam meets Luvleen, he falls for her as well. I think it was somewhere around this point that everything became perfectly predictable, which caused me to lose my ability to really care any more. But since the film goes on, we must too. Agam goes out of his way to make sure that the love of his life is happy and with the man she loves, even if it comes at the cost of his own happiness. Not only does Ishqedarriyaan feature a non expressive hero and an overly expressive heroine, it takes the cake when it brings in the token sardar kid because the sardar kid in this film isn't just any sardar kid, he's the most annoying little ball of lard you've ever seen. The child would have been funny if he was naïve. But the innocence is lost the moment he is made to mouth adult dialogues and court his female classmates. The soundtrack is only bearable, recycled heartbroken lyrics with a heavier bass than your usual Arijit Singh or Mohit Suri song. Both sound design and set design could have been infinitely better. 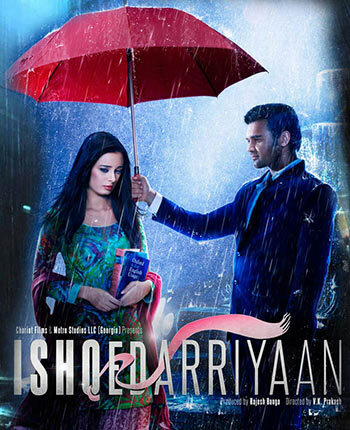 Ishqedarriyaan 's first and biggest flaw lies in its script. It creates more characters than it can handle, thus creating more subplots than it can tie up in the end. It leaves you with more questions than answers. Even water and oil have more chemistry than Jimmy and Lara Aunty. There is so much awkwardness between the two of them and the way they talk would make borderline asocial nerds look like communications experts. Agam might be a billionaire but I'm willing to donate him a dialogue writer if they promise to make it stop. The trouble with Ishqedarriyaan is that it isn't even bad enough to be good. It's just plain old dull. Lost in a world of its own, the film forgets to engage the viewer. The makers of the film might need to offer free tea at the screenings to give the audience an incentive to stay awake. The kindest thing I can say about Ishqedarriyaan is that it is yawn worthy.